I have an invitation to be interviewed for a podcast. I said yes, and went to that person's website to see what all they have been saying there about children's books. They'd been to the Eric Carle museum, and to the Seuss one, too. I saw they'd linked to other sites that have lists of picture books about museums. Those responses are White Privilege in action. And, they are wrong. 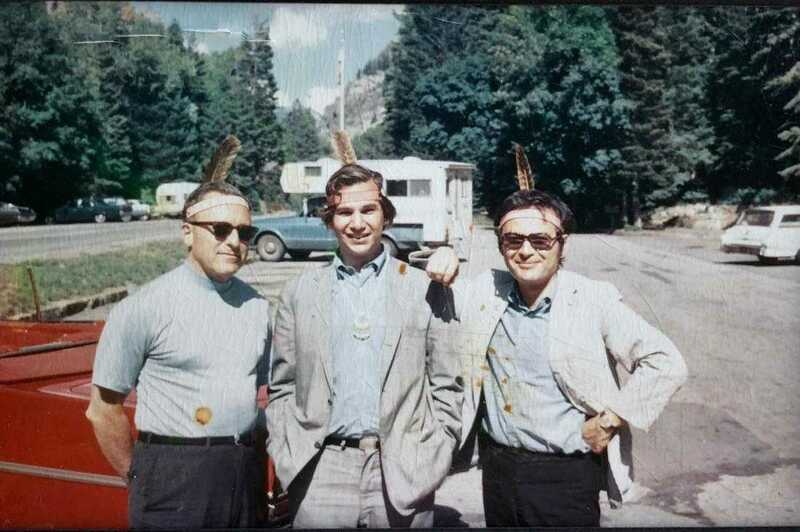 When people dismiss misrepresentations of Native people, they are inadvertently--and perhaps intentionally--saying it is ok to dehumanize anyone who is not like themselves. In that mindset, "those" people and their humanity don't matter. There are consequences for that dismissal. We're seeing those consequences, right now, in national politics as we wait to see if the US Senate is going to vote yes on Brett Kavanaugh. His response to them is similar in tone and judgement to people who tell me and others who critique misrepresentations in children's and young adult books that our objections are misplaced. To them, children's books are harmless, and inconsequential. Critiques of them, they argue, can be ignored. Of course, children's books do matter. They shape how readers think about the world. Critiques of misrepresentations of Native people are efforts to get everyone to see us as human beings. Many women are feeling dismissed right now. Dr. Ford's testimony reminds them of their experiences with sexual assault and sexual harassment. They're speaking up, but the president and most of the GOP and all those who are chanting "We want Kavanaugh" are dismissing them. We'll know, soon, if Kavanaugh will become a justice. I suspect he will be confirmed. Those who feel he has no place on the court will feel defeated. I have no doubt whatsoever that--amongst them--there are many who said misrepresentations of Native people in children's books don't matter. So, I hope that they will reflect on the ways that they may have inadvertently contributed to a status quo that says the voices of those who have spoken about injustice do not matter. And of course, I hope that everyone who is involved with children's books will reflect on the ways that they, too, are inadvertently contributing to a status quo that says this or that voice does not matter. Hmmm... What was Sendak thinking about when he created WHERE THE WILD THINGS ARE? A few months ago, a reader sent me a link that she'd know I'd be interested in... to an auction site that was auctioning a framed collage (collage might not be the right word) of three items. 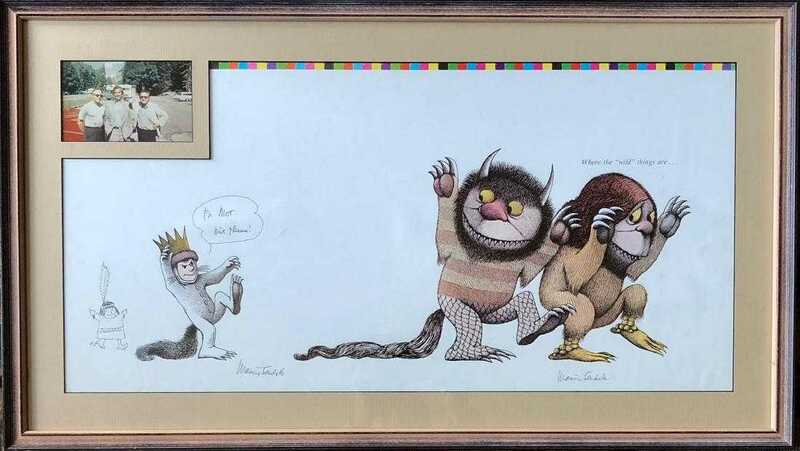 Here's the framed item, titled by the auction house "Sendak Drawing on Wild Things Proof Sheet W/Photograph." Rare 1963 original ink drawing with added personal photograph on the promotion proof sheet for the first edition of "Where The Wild Things Are", signed and illustrated by Maurice Sendak. 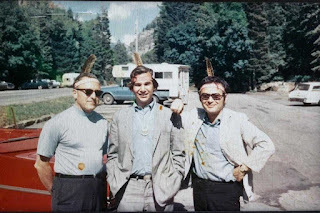 Original colored photograph was taken during The Childrens Book Confrence, University of Utah, Park City, Utah-1960 of Sendak with Morton Schindel (of Western Woods) and possibly Tomi Ungerer. 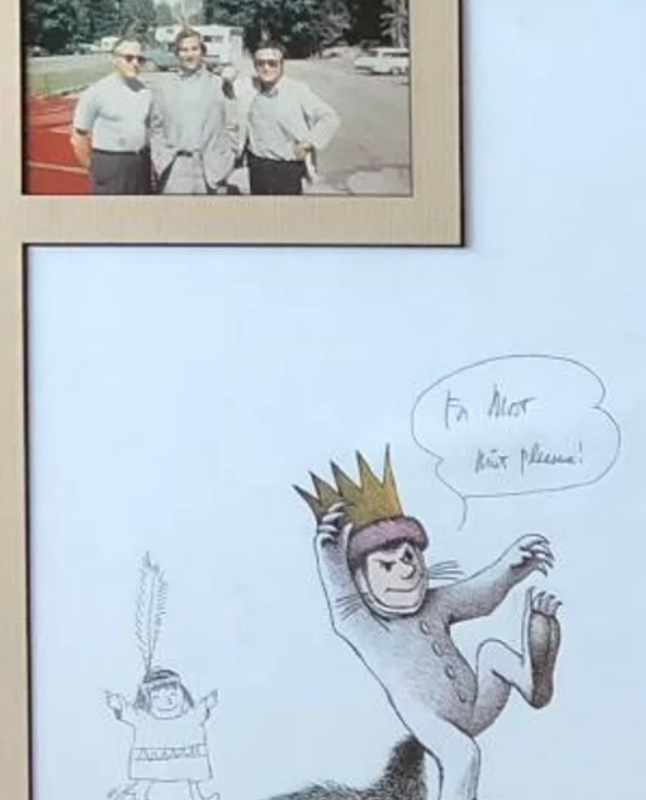 Original ink sketch and inscription by Sendak of Indian boy with feather inscribed and signed twice by Maurice Sendak. *Photograph reveals a feather on each of the artist's heads. The photograph of a young Morton Schindel (Weston Woods). Maurice Sendak and (believed to be) Tomi Ungerer. Why each figure has a feather standing in their hair is unknown, but mimicked in Sendak's ink drawing of an Indian also with a single feather. This proof sheet for WILD THINGS comes from the original first printing of the book (1963) as Sendak would have wanted to show off his latest project to Morton Schindel (Weston Woods). Note the slight off registry along the bottom edge of the Wild Things image which was one of the initial problems Harper & Row had in printing the earliest known copies. Fascinating, isn't it? If a scholar of Sendak's work finds additional information about this, I'd love to see it! What was Sendak thinking? What do you think about it?